There is nothing quite like getting lost in a film, especially one that inspires you to visit its location. It could be said that a good travel film is the only cure (other than actually travelling of course) for the pesky travel bug, or perhaps it simply feeds it. No matter which, those with adventurous hearts can resist a good travel movie about as easily as we can resist booking a plane ticket. With that in mind, here are five adventures to be had and the films that inspired them. A classic as a book and as a film, will have you putting on your finest string of pearls, your favourite pair of Dolce & Gabana sunglasses and booking a ticket to the city that never sleeps in no time. Unlike Holly Golightly, your New York adventure won’t see you being locked out of your apartment or having to stand outside Tiffany’s with a croissant. Instead, a stay in one of New York’s finest hotel suites and treat yourself to an official breakfast at Tiffany’s and a spot of retail therapy. When it comes to choosing a hotel, New York is bursting with luxury options. Where better to stay than the Penthouse Suite at one of the city’s finest hotels: The Mark Hotel. This hotel suite is not only one of the most expensive in New York but also a contender for the most expensive suite in the world. The duplex penthouse consists of five bedrooms, six baths, two powder rooms, a kitchen, a dining room and living room that doubles as a ballroom and a library. Everything in the suite screams ultimate luxury, including the specially-designed furniture by Jacques Grange. Organise a driver to take you from the Mark Hotel on the famous Upper East Side to the Blue Box Café, which is located on the fourth floor of the Tiffany’s flagship store. Guests can expect the classic colour palette of silver and robin egg blue (more commonly known as Tiffany blue) that’s found on the floors below throughout the cafe. The menu is exclusively prix fixe, and guests have the option of selecting from breakfast, lunch, or afternoon tea prix fixe menus at any seating. Reservations for The Blue Box Cafe at Tiffany & Co open up to 30 days in advance. To follow your meal, there is nothing that helps the mind, body and soul so much as a little retail therapy – whether you wish to browse or have a personalised experience, Tiffany & Co will ensure your every desire is met. Warm up your vocal chords and pack your sunscreen – it’s time to sail around the Greek Islands featured in Mamma Mia. Nicknamed ‘the Emerald of the Aegean’, the Sporades are a collection of 24 islands off the east coast of Greece which are bursting with natural beauty. 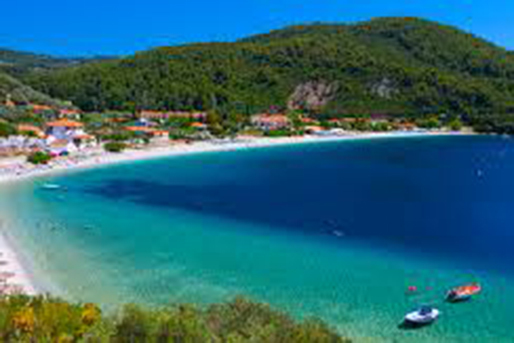 Among these jewels is the island of Skópelos, whose azure waters and golden sands were irresistible to the team scouting a location in which to film the hit film, Mamma Mia. Even with the popularity of the film, Skópelos remains relatively untouched, plus there are 23 other islands in the group that share its unparalleled beauty – what better way to enjoy them all than by hiring a private, luxury charter yacht? The best time to set sail is during the summer months, when the weather is warm and sailing conditions are in their prime. When you’re not relaxing on the pristine beaches or taking a dip in the sparkling water, you can head to the mainland to explore the traditional architecture of cobblestones, red-tiled roofs and classic stone churches. These quaint islands will have you feeling like you’ve stepped back in time… and perhaps inspire a song or two. Of all the islands in the group, Skópelos is the most popular, and many people will tell you not to leave without tasting a traditional Skópelos cheese pie – a spiral delicacy made of local goat cheese and pastry. Whether you’re a Donna, a Rosie, a Tanya or a Sophie, it’s impossible to say no to a luxury charter, quiet relaxation and island adventures in Greece. Whilst you may wish to travel to South America by private jet rather than in a house attached to thousands of helium balloons, Up will inspire you to go no matter how you get there. After all, it’s tough to resist the charm and heart of this film, and more so to resist the desire to travel to the real “Paradise Falls” which, although fictional, were inspired by Angel Falls in the Guayana highlands of Venezuela. Recorded as the highest waterfall in the world (they’re fifteen times higher than Niagara Falls), experiencing the sheer enormity of Angel Falls is one for the bucket list. Much like Carl and Russell in the movie, a journey here is for the daring, the curious and the inner explorer. This quirky Wes Anderson film will have you packing your bags for Budapest in no time. Whilst the film is set in a made-up location, in a made-up hotel, every story has an element of truth to it. In this case, The Grand Budapest Hotel in the film was inspired by luxury Art-Nouveau Danubius Hotel Gellért which, since its opening in 1918, has seen presidents and royalty walk through its doors, and has even featured in Hollywood films. The film centres around legendary concierge of The Grand Budapest Hotel, Gustave H. In the film, Gustave H. walks a fine line between being unbelievably professional and something a touch more intimate with the hotel guests. The concierge team at Hotel Gellért are dedicated to five-star service, although without the added extras Gustave H. brings to the… table. 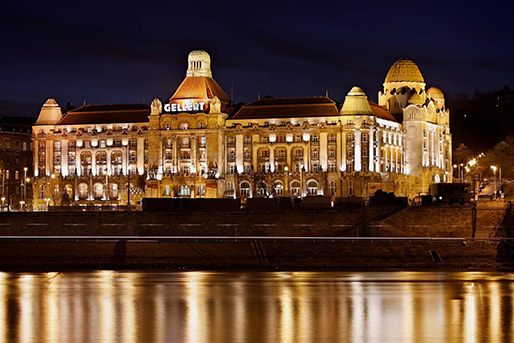 To add to the whole grand experience at Hotel Gellért, the iconic landmark hotel also houses the world-famous Gellért Baths, where guests can enjoy wellness treatments, medical programmes, and the outdoor pool still has its original wave-generating device that was first installed in 1927. History, culture and just a touch of comedy, this film and the hotel that inspired it are sure to set your heart on fire. This beloved French film will set your heart racing, thanks to the quirky love story of Amélie, Nino, and adventures of a little garden gnome. Paris has certain je ne sais quoi about it. It’s a city of romance, history and rich culture. And when it comes to finding the perfect suite, all three of those qualities are vital. As one of the most intimate of the Palaces in Paris, La Réserve Paris Hotel and Spa offers romance, history and culture in abundance. Staff at this boutique hotel are masters of the little details, including providing personalised cards for each guest, with the guest’s name and hotel address printed on them. At La Réserve, the suite of suites is none other than the grand Palais Suite. Decorated with luscious, burgundy velvet and Napoleon III antiques, and housing floor-to-ceiling windows with balconies overlooking the Champs-Élysées Gardens, this two-bedroom suite is fit for royalty. With the popularity of the film, it is little wonder that Café des 2 Moulins (Café of the Two Mills) is not only popular but also known as one of the best cafés in Paris. Located in the artistic Montmartre district in Paris, it’s a great place to enjoy a drink or bistro cuisine before an evening of Champagne and dancing at the Moulin Rouge? From Paris, you can continue your film journey follow the path of its travelling gnome: next stop Moscow, Egypt, Morocco… and beyond. For more personalised information tips and advice, or to book this incredible holiday, contact your local TravelManagers’ personal travel manager here.